Bibles moralisées (moralized Bibles) are lavish picture books originating in thirteenth-century France that pair episodes from scripture with allegorical interpretations—image interpreting image. Captions are given, but the pictures dominate and do the main interpretive work. The Bible moralisée known as Vienna 2554 from the Austrian National Library is the most famous and one of the earliest of what is a relatively small genre. Each of its thousand-plus miniatures is framed within a medallion, a presentation common to Gothic stained glass, which are then arranged on each page into two parallel columns of four. A top-right detail from folio 2v is shown above: the Creation of Eve as a prefiguration of the Birth of the Church. In the top image God pulls Eve up out of Adam’s side, bringing her to birth, while in the bottom image he likewise performs a midwifing function, delivering Ecclesia from the wound in Christ’s side. Ecclesia is a personification of the church, crowned (because she reigns with Christ) and holding a chalice (a bottle of sorts—vessel of her mother’s liquid that sustains her). But not only is Christ our mother, he is also our spouse, much like Adam was both “mother” and spouse to Eve. Just as the first Eve sprung to life from a tear in her husband’s flesh, so did the church come into being out of the torn flesh of Christ. Were it not for Christ’s death, our union with him would not be possible; the church would not exist. To these church fathers’ written commentaries, our artist adds God the Father as labor coach and deliverer, gently facilitating the birth. What a compassionate image! Childbirth is an apt metaphor for the work of Christ on the cross. Like a mother, Christ gave his body over so that out of it could come new life, undergoing great physical pain in the process. But all that pain was eclipsed by joy when he beheld the fruit of his “womb”: the church, his radiant bride, flesh of his flesh. 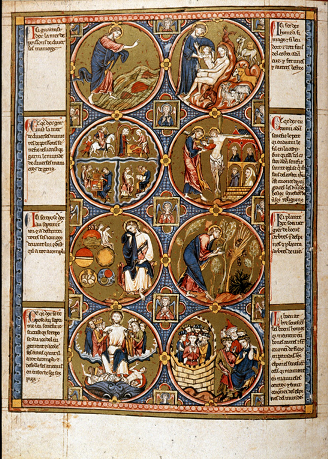 Bible moralisèe: The Creation of Eve and The Birth of Ecclesia, fol. 2v (detail), ONB Han. Cod. 2554, Österreichische Nationalbibliothek, Vienna. Made in Paris, 1225–49. Record: http://data.onb.ac.at/rec/AL00152849. Digitized manuscript: http://data.onb.ac.at/dtl/2246547 (see scan #8). Victoria Emily Jones lives in the Baltimore area of the United States, where she works as an editorial freelancer and blogs at ArtandTheology.org. Her educational background is in journalism, English literature, and music, but her current research focuses on ways in which the visual arts can stimulate renewed theological engagement with the Bible. She is in the process of developing an online biblical art gallery, a collection of artworks from all eras that engage with specific texts of scripture. 1. Les Oeuvres de Marguerite d’Oingt, ed. A. Duraffour, P. Gardette, and P. Durdilly (Paris: Les Belles Lettres, 1965), 77–79. Cited in Caroline Walker Bynum, Fragmentation and Redemption: Essays on Gender and the Human Body in Medieval Religion (New York: Zone Books, 1991), 97. 2. No. 2335 from the notorious twelfth appendix of the Herrnhuter Gesangbuch (Herrnhut Hymnbook), published 1745. Language like this led historian Aaron Fogleman, dismissing its metaphoric quality, to claim that some Moravians believed Jesus to be female. See Jesus Is Female: Moravians and Radical Religion in Early America (Philadelphia: University of Pennsylvania Press, 2008).